What Bella doesn’t realize is the closer she gets to him, the more she is putting herself and those around her at risk. And, it might be too late to turn back…. Help me! I’M ADDICTED TO TWILIGHT!! Okay, so I went into these books very, very uncertain. You see, I’ve heard good and bad about these books…but mostly bad. And as much as I wanted to read them, I didn’t want to suffer 4 awful books to make up my mind. But I’ve surprised myself a lot. I’m a sucker for a good love story, and here we go. Stephanie Meyer has put one in front of me and I can’t help but love her for it. But…as with everyone else seems to, I have annoyances. Firstly, why do the vampires SPARKLE?! As lovely as this must be, okay it’s weird. It’s not wrong…and I kind of like it I think? But still, it’s taken some getting used to. But honestly? At this point, people should get over the fact Bella is just a hormonal teenager who happens to be in love. Maybe that’s just me being able to relate to her pretty easily? I don’t want anyone to take that statement the wrong way – but it annoys me that people are annoyed by her so easily! For some people, love is a massive thing, and I completely get that. However, there was times when I didn’t want Bella and Edward’s love to be quite so…instant? They barely know each other when they fall in love. But still, I can’t bring myself to be annoyed or upset…because Stephanie Meyer made me feel everything Bella did. Before I go, can I just add that? Stephanie Meyer is an incredible writer. She seems to be able to write for any age, any audience. Anyone. her writing is easy to read and relate to, and the pages just flick past without a bother. I could read these books for hours without as much as a glance to the clock. These books kind of make you forget about anything other than what’s going on inside them. Lastly…my rating! I was going to give this a 4. But you know what? 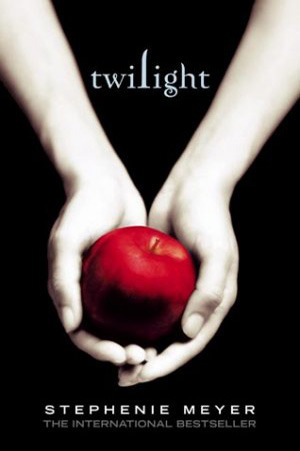 You stole my heart, Stephanie Meyer. And you took all 5 moons with it.